There may never be a “perfect movie,” but there can be perfect moments within movies. YouTuber Jim Casey has taken the time to collect and organize some fine examples of such moments, and he’s turned them into a stirring, inspirational two-part series called “The Most Beautiful Shots In Movie History.” This is an elegant tribute to the visual power of cinema. And, make no mistake, it’s strictly the visuals that Casey is focusing on here; he includes no dialogue from the films he’s excerpting. This is, at heart, a tribute to the work of cinematographers, costume designers, and art directors, not screenwriters. Casey says he took his inspiration from this 2015 BuzzFeed article by Dan Dalton. For its soundtrack, the first installment uses Caro Emerald’s poignant cover of Lou Reed’s “Perfect Day.” The usual suspects are represented here: Akira Kurosawa, Alfred Hitchcock, Quentin Tarantino, Stanley Kubrick, Hayao Miyazaki, Joel and Ethan Coen, etc. The symmetrical compositions of Wes Anderson get a nod or two as well. But there are eccentric choices along the way. 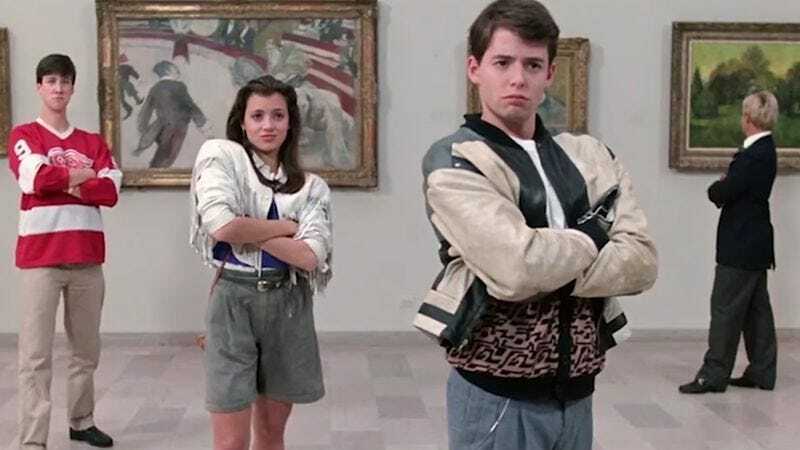 Few would label John Hughes as a visual stylist, for instance, but a beautifully balanced shot from Ferris Bueller’s Day Off holds its own among fierce competition. The second half is prefaced by an excerpt from this March 1960 interview with director Orson Welles on the BBC’s Monitor. “I thought you could do anything with a camera that an eye could do,” Welles says. He cites his own dreams and his “sheer ignorance” as inspiration. This time around, in addition to shots from Dalton’s visual essay, Casey also takes suggestions from the comments section on his first video. Interestingly, the soundtrack music comes from a 1997 Mr. Bean movie. No shots from that particular film made the cut, unfortunately.